A Darling Dress and BAGS GALORE! 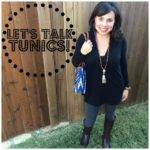 Did y’all see my TUNICS post last Friday? If you didn’t, click HERE, because you don’t want to miss it! Well, today I have another option for you! I ordered this dress when I ordered the other 23,000 tunics (some say that I have a flare for the dramatic) for my tunics post, but it didn’t come in until Thursday, so it’s getting it’s own post today! I’m almost 5’4″, and the dress was quite long on me (by my standards anyway). It definitely looks like a dress on me (vs. a long shirt or tunic), so I think it will be a great length for you taller girls as well. I loved the wash of the denim, the detailing on the upper pockets, and the fact that it has lower pockets. 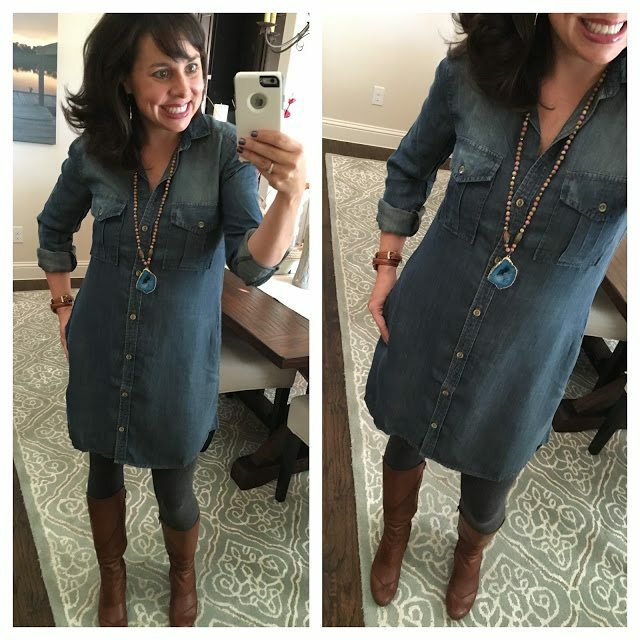 And although it looks like a classic distressed denim, it’s actually has a softer feel like chambray would. And how great does it look with the jasper and druzy pendant!?! kind of a no brainer if you ask me. Here are all the outfit details for you! This is the watch I wear in 80% of my outfit posts! Click HERE to see front, back, and side views so you can really get a feel for the length of the dress at all angles. For size reference, I’m wearing a small in the dress, so I think it’s true to size. Like I said previously, it definitely looks like a dress on me, but I think it will just look more like a long top on you taller girls. I’m wearing a small in the leggings, so they are also true to size. So, in an attempt to get some “real” pics for the blog (you know, without my cell phone in them), I grabbed my hubby and headed outside. We were outside for approximately 23 seconds when I hollered something similar to “FORGET THIS” and “FOR THE LOVE, ISN’T IT OCTOBER??? ?” and we headed back inside. So, this is the one shot we got. I can’t wait until it’s not in the 90s and I can wear this outfit for real. Get The Look For Yourself Here. 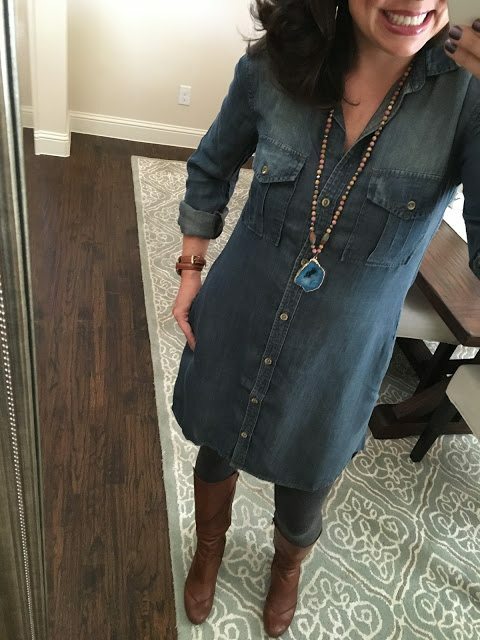 The olive color appears in the below thumbnail, but if you click on it, you will get taken directly to the distressed denim dress as well. Click HERE for the bag. 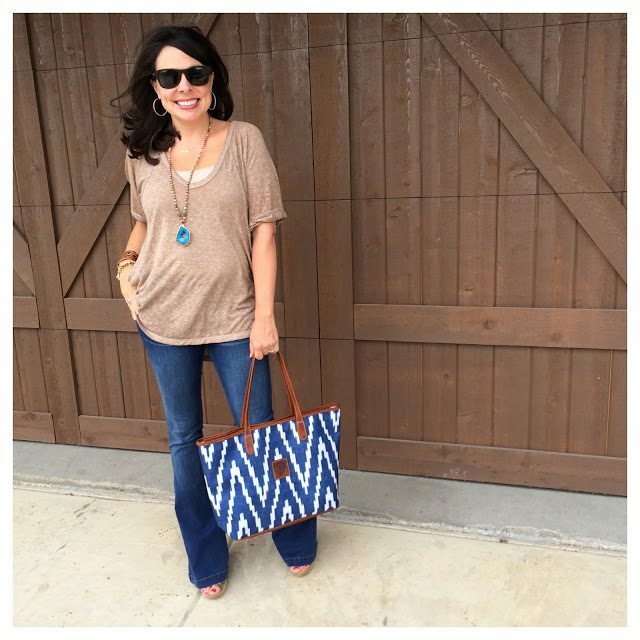 Click HERE….Go to New Arrivals….click on Create Your Own Fall Fashion…choose the Savannah zippered tote….for color choose the blue…..and for the pattern choose the fourth pattern from the left. OR, you can also spend a sweet forever playing around with other color and pattern options. And remember, use the code PTMTSAVE10 for 10% OFF your entire order! Click HERE and follow the instructions above. 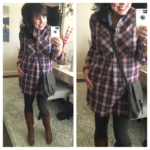 I ADORE this bag, and even though I’ve only had it for like 3 weeks, you’ve already seen it in several posts….because it seems to kick almost every outfit up a couple of notches! Here it is again in a post from a couple of weeks ago. Look how cute it makes a basic tee and jeans! And looky there, it’s the jasper and druzy necklace again. Click HERE to see the entire post and read all about it. For size reference, I’m wearing a 7 in the jeans. One of the awesome things about Barrington, is the incredible selection they have. You wouldn’t believe the number of combos you can put together. They’ve got totes, travel bags, laptop cases, diaper bags, cosmetic cases, golf bags, a crossbody bag, money clips, and the list goes on and on! And then you add the different colors, patterns, and monogram choices and OH MY! Just look at one of their publicity shots and the varying patterns to choose from in this one shot to start to get an idea about all they have available! And ladies, this is just the tip of the iceberg! 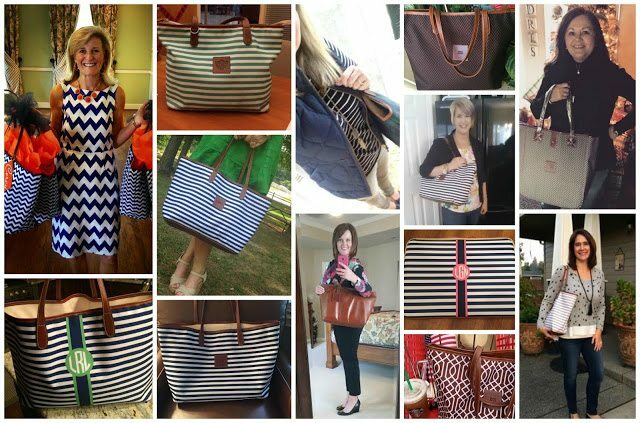 When I did my first post in my Barrington 3 part series, I announced a contest where readers would send in pictures of the Barrington bags they already had, and one of the readers would be randomly chosen to win a new fall St. Anne or Savannah tote of her choice! So, Part II today is showing off those pics! I got lots of pics that were so much fun to see…but I also received some pretty powerful testimonial e-mails about not only your love for the product, but also your love for the company and their customer service! Here are some amazing Barrington bags from Pinterest Told Me to readers!!! You girls are all DARLING and your bags are FABULOUS!! I thought I would share a handful of the e-mails as well! I emailed you almost a year ago with questions about Barrington Bags and meant to send you a picture way back then when it was delivered! So I attached a picture of me earlier today. 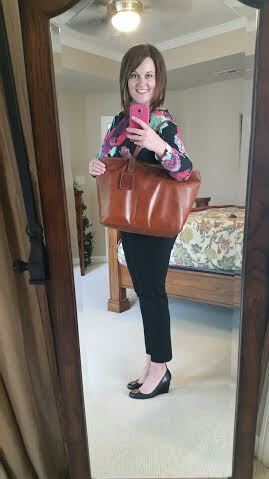 I ended up buying the St Anne tote in the Florentine leather. I am wearing black in the picture, so you can see that the Florentine leather is really versatile, because who has time to change out their bag every day? I was also concerned about the thinner handles, but they have held up great as well. This has been my work bag for the past year and I LOVE IT! I am in sales and on the road all the time visiting clients. I needed a cute, stylish bag that was functional and could hold my laptop, lunch, and all the other stuff I cram in there. So worth the purchase! Then after my bag had a small snag in the handle stitching I emailed the company to see if this was normal. They quickly responded that they wanted to send me a replacement bag and asked me to choose one. Choose one, AGAIN??! I gave them two choices and guess what?? They sent me BOTH bags and the sweetest handwritten note!! I was shocked and so excited! My second bag is the St. Anne tote in the black watch plaid (I can’t find the exact name of the plaid on their website for some reason!) 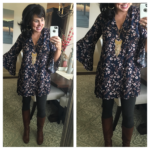 I LOVE LOVE it for fall! I am currently saving for my third bag and will recommend them to anyone wanting a great, custom bag! I get compliments on my bags every time I wear them! – Celeste W.
Hello! Here is my St. Anne’s diaper bag from Barrington! 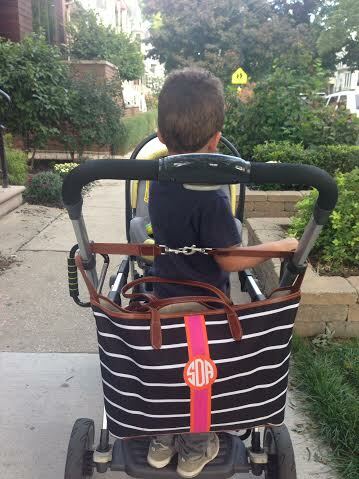 It’s the black and white French Stripe with the magenta and orange monogram stripe. I use this bag everyday and love that it holds everything I need for my 3 year old and 3 month old. This bag is perfect for throwing on the stroller or over your shoulder. It also has great pockets inside for keeping all the kid’s stuff organized. 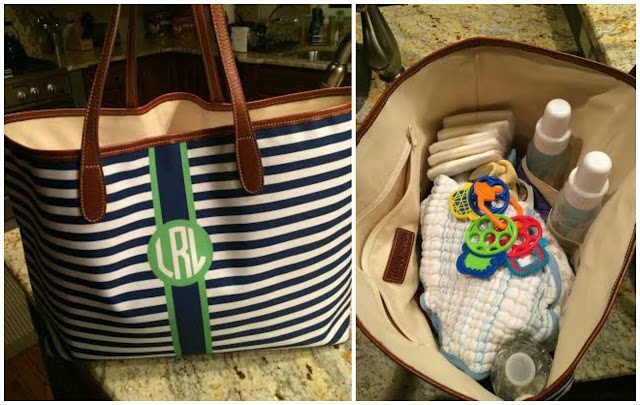 I feel like I couldn’t have chosen a better diaper bag. One other thing about this company, when I first ordered this bag, it arrived damaged (the fault of the shipping company). When I called the company, they were SO helpful. I wanted to take this bag on a trip we were going on and they weren’t going to be able to get me a replacement in time because of the monogram. So Gloria from costumer relations sent me one that they had in their showroom so that I had a bag for the trip. I was very impressed with their costumer service! I will defiantly be ordering again from Barrington in the future! I am a dedicated reader who was introduced to your blog by a friend a little over a year ago. She would be so surprised to see me actually writing to you and participating with my favorite work bags from Barrington. This is so worth it though; you have influenced several of my purchasing decisions and this is most definitely my favorite. No regrets!I started off with the Reptile St. Anne tote and quickly moved on to purchase #2, the Savannah monogram tote. I love them both and plan to get the laptop cover next, maybe in the same beautiful blue and white chevron pattern as your most recent bag. These are great for my file folders and notebooks, but I also love the pockets for my cell phone and I use the zippered side section as a mini purse for makeup and such when I don’t want to carry an additional bag. These are my go to travel bags for weekend trips as they are more functional for carrying a camera or light jacket than any of my traditional purses. I love love love them. Thank you for highlighting the great products from Barrington and introducing me to this great brand! I love your blogs and read almost every one of them! Even though you are younger than me, I try to incorporate your ideas into my age group. Thanks for doing it – I know it must be exhausting day in and day out!! I have the St. Anne Tote and LOVE IT! Between teaching first grade, going to grad class, and everything in between, it holds everything! I also use it as a carry on whenever I travel! Not sure what I’d do without it! – Whitney P.
Like most woman, I have a collection of handbags. As a daytime high school educator and part time college professor, I needed a tote that would allow me to carry my life (and laptop) around with some semblance of style. Enter the Barrington tote that I purchased this summer. I.LOVE.THIS.BAG. The leather just gets better as it ages and I can carry my make-up, wallet, an umbrella, extra pair of flats, laptop, phone, books, etc., etc., etc. And my monogrammed initial tab is the icing on the cake for me. I mean, it’s all about the monogram and who doesn’t want icing on their cake that won’t add inches to their hips! Again – love love love your blog, FB & Insta! I’m a faithful reader and truly appreciate all your hard work to help us ladies out!! You’re the best!! It sounds like you ladies love Barrington just as much as I do, and that’s saying something! I was so excited to read all of your SUPER positive experiences with not just the products, but also the company! LOVE hearing that!!!!! THANK YOU LADIES for taking the time to write those e-mails! There were a handful of pics that didn’t make it to the collage because they for some reason ended up in my SPAM folder, and I didn’t see them until late last night, but those entries were counted as well (Emily M, Elizabeth K, Suzanne R., and Reynolds H.). I wrote down all the entrant’s names, cut the names up into small pieces of paper, and then I had Carter draw the winner. Elizabeth, you have 72 hours to respond to the e-mail I send you today and claim your prize! If you don’t respond within 72 hours, another winner will be chosen! Jennifer, you will receive a necklace for yourself and 3 friends! Each necklace can be a maximum of $50! Jennifer and Christina, please e-mail be directly at pinteresttoldmeto@yahoo.com to claim your prizes! Please e-mail within the next 72 hours or a new winner will be chosen! Hope everybody has a great day! 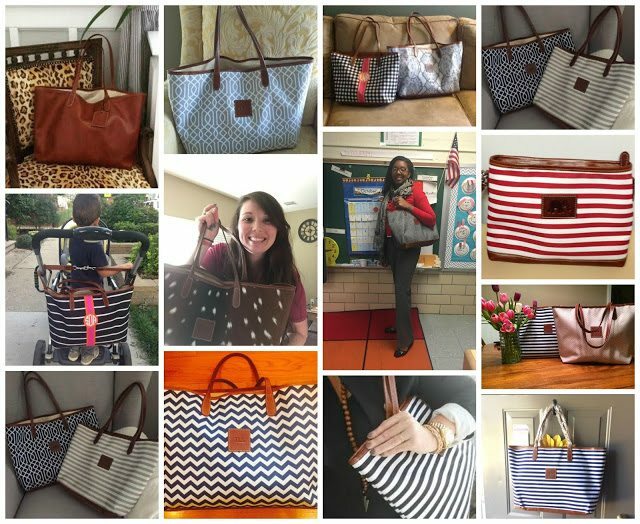 I loved seeing all your bags, hearing your testimonials, and announcing contest winners! 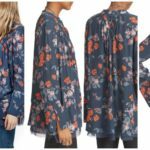 SHOPBOP is having a ginormous sale! Lots of great items, and several items that I already have (those items are marked with a heart on the collage). 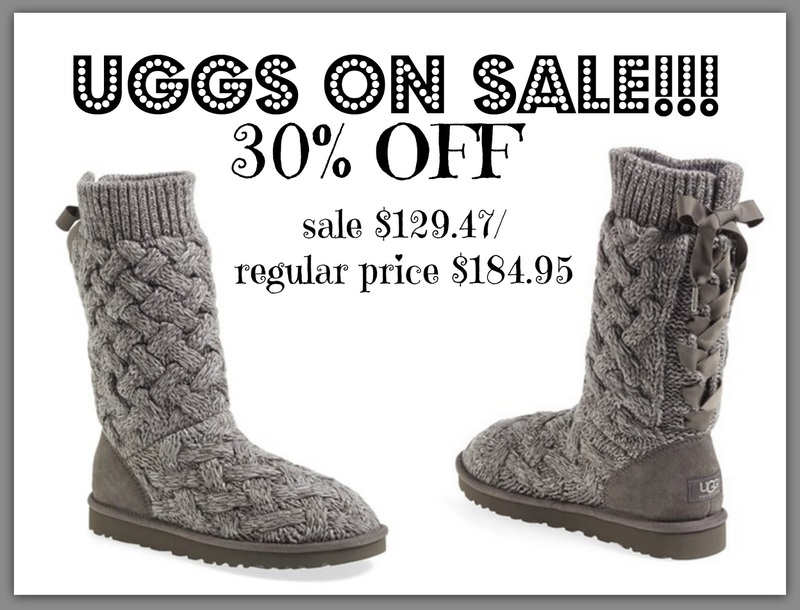 Click HERE for the cardi UGGs pictured below NOW ON SALE. Selected colors of the Bailey bow boot is on sale as well HERE (only limited sizes remaining). Girl!!! Those readers were so cute and on point with those bags!! 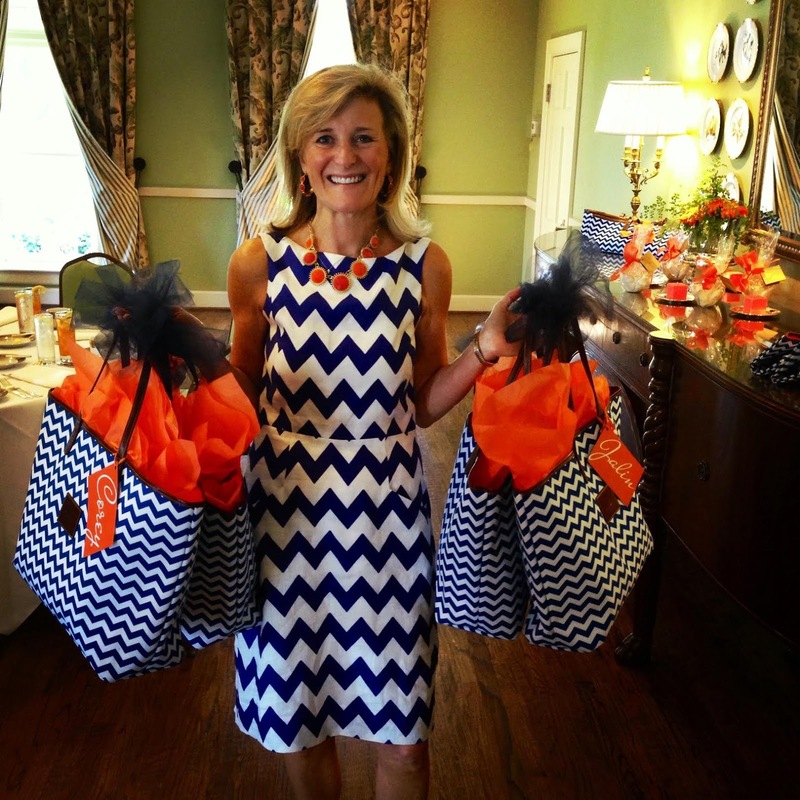 I would have been ecstatic to get a Barrington tote as a bridesmaid gift!! Hi Shaeffer! I love reading your blog and have purchased countless items upon your recommendation! 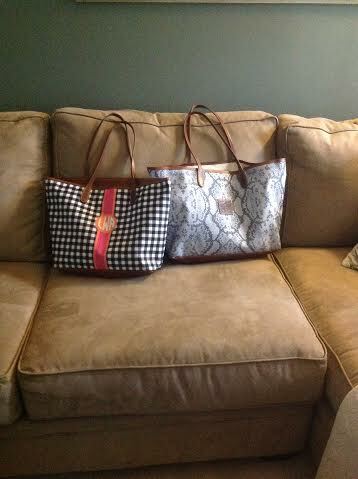 I am looking to purchase my first Barrington bag but I cannot decide which pattern to get. I love the cheetah but wonder if it might be overkill. I also love stripes and chevron. 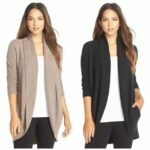 I would like something that is versatile and will go with a lot of outfits. I would love a recommendation (or two) from you! 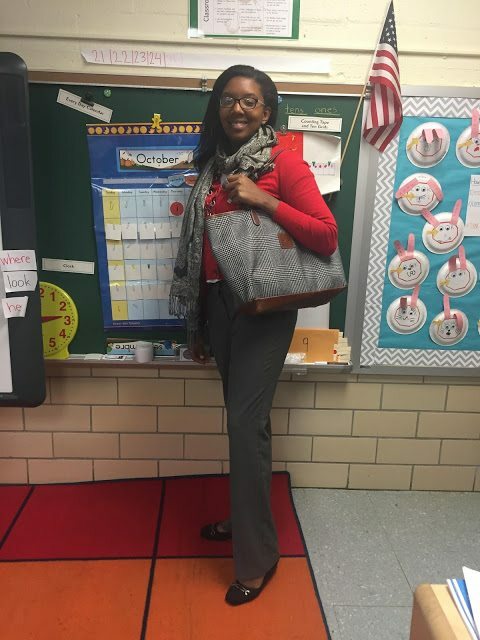 Those readers with their Barrington bags are PRECIOUS!!! Love!! Two things: that dress is just perfection! And I could not love your reader pics more! Oh my goodness! What cute readers you have!!! I love, love, love those pictures! Just FYI, bought the blue checked dress from Nordics-perfection! 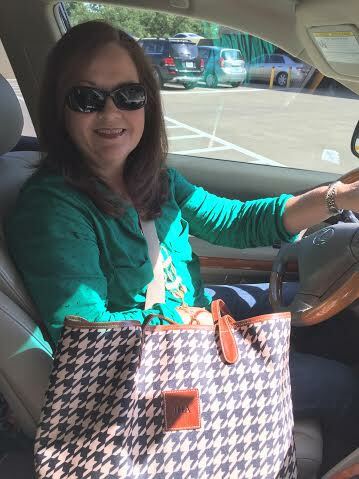 Also, LOVE the Chevron mom….mortified her daugher, made this daughter smile! She's adorable! Will you please hurry up and get yourself a reality show all about shopping!!?? I would watch it faithfully! 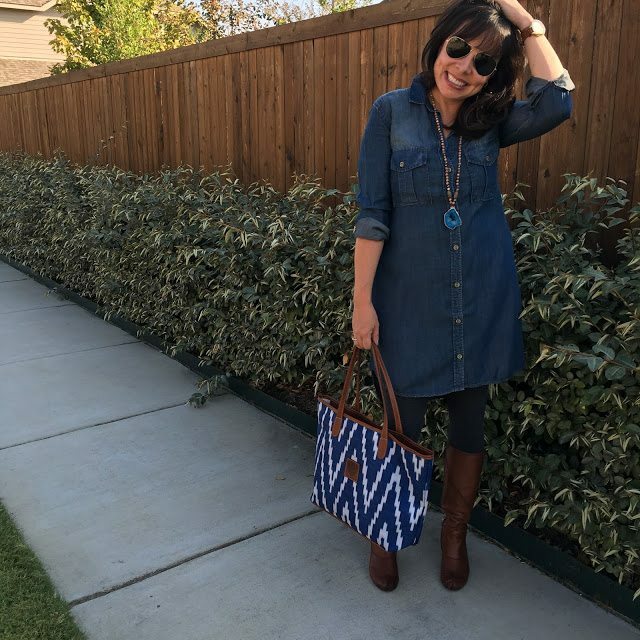 Your chambray dress is just so perfect!! 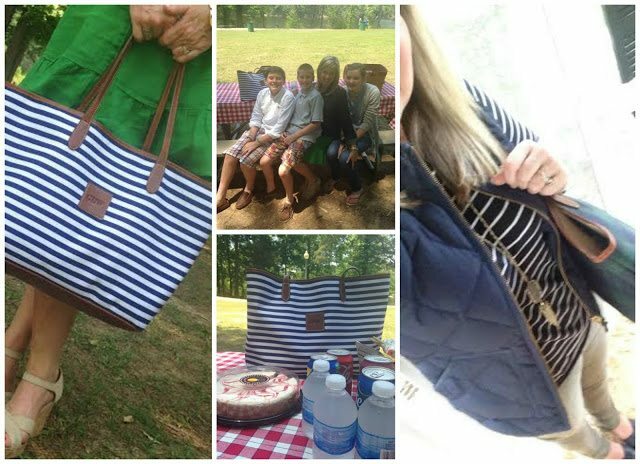 And, I love those Barrington bags!! DOH! I just ordered my Barrington Bag last week after seeing it again on your website. Wish I had the coupon code then 🙁 Guess, I'll just have to order another! 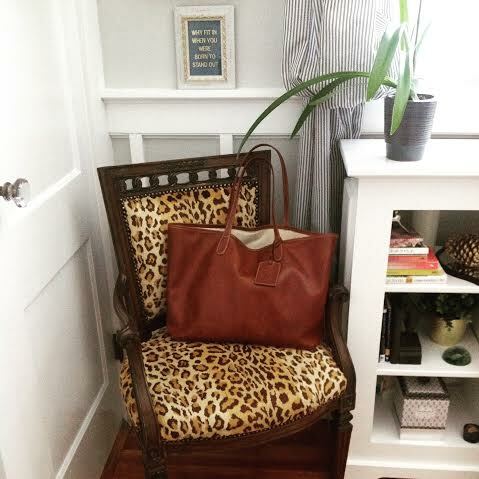 Am I having a "moment" — I cannot find the leather version of the Savannah on the website. Do you know how to find that one? Ok, Sheaffer, I hate to ask of you the impossible, but here goes…sometimes I feel at my age, "structure" in a clothing piece is helpful to keep it from clinging and showing off the not-so-hot muffin tops, bulges, etc…so I LOVE the dress you featured today and it looks GREAT on your thin frame…but when you described it more as chambray rather than denim I got worried…do you think it's super soft or does it have a little structure to it?1? So good to know…you are such a GREAT personal shopper 😉 THANK YOU!! Does that dress have pockets?